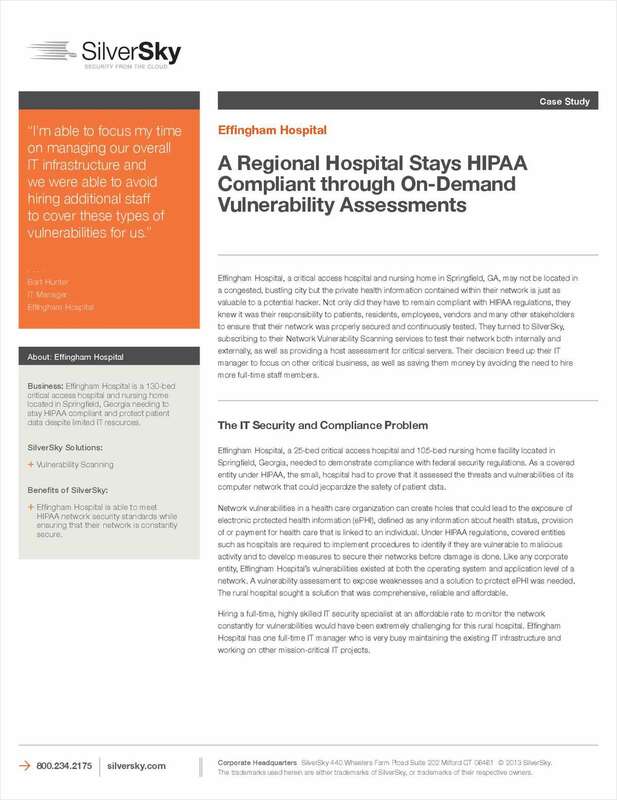 "A Regional Hospital Stays HIPAA Compliant through On-Demand Vulnerability Assessments"
Free Case Study: "A Regional Hospital Stays HIPAA Compliant through On-Demand Vulnerability Assessments"
Effingham Hospital, a critical access hospital and nursing home in Springfield, GA, may not be located in a congested, bustling city but the private health information contained within their network is just as valuable to a potential hacker. Not only did they have to remain compliant with HIPAA regulations, they knew it was their responsibility to patients, residents, employees, vendors and many other stakeholders to ensure that their network was properly secured and continuously tested. By submitting this content request, I have legitimate interest in the content and agree that SilverSky, their partners, and the creators of any other content I have selected may contact me regarding news, products, and services that may be of interest to me.